All of us at Tustin Hearing Center are so excited to share this great story from our patient, Debbie! Debbie has been our patient for over one year, and we love seeing her every time she comes in! Last month, we invited all of our patients to celebrate Pet Appreciation Week with us by bringing in pictures with their furry (or feathered) friends! Debbie and her pups were the winners of our PetSmart gift card during the week, which is really exciting since Debbie works so closely with dogs in canine sports! Debbie came to us ready to pursue better hearing so she could stay active in the hobbies she loves and cherishes. She wanted a convenient and easy solution - something better than her dad’s “old” hearing aids. Lyric was the perfect fit for Debbie’s life and unique activities! 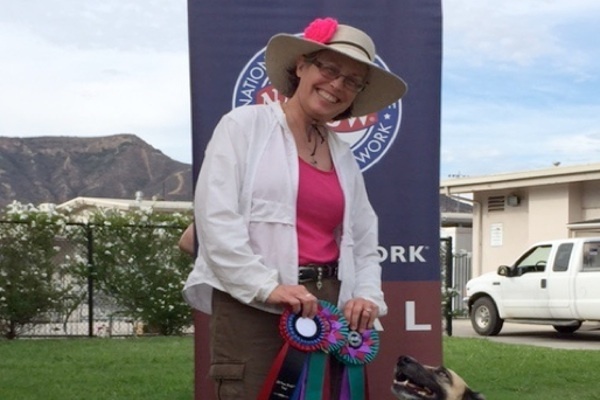 Read more about Debbie’s passion and how her Lyric hearing devices help her during canine competitions! Her instructor from her canine sports even included a note about how much of a change she has seen in Debbie’s training! “My name is Debbie, and I used to have a hearing problem…but NOT anymore! My father wore traditional hearing aids for years and I watched him constantly fiddling with them - replacing batteries, etc., and I was convinced I wanted a better solution. My passion is training and competing in K9 Nose Work - a sport focusing on competitive scent work and Obedience/Rally Obedience- with my dogs, Zoey, Red and Baxter. Being able to hear is really important in these canine sports. For example, one needs to be able to hear what the judge is asking you to do in a competition obedience ring. But even more importantly, and really the main reason that I sought out ways to improve my hearing, was I needed to hear breathing changes in my dogs as they search for hidden odors (birch, anise, and cloves) in training scenarios (in interiors/exteriors/vehicles and with containers), and especially when competing for upper level titles in Nose Work. You see, when a dog gets into the “scent cone” of a hidden odor, their breathing changes. If you cannot hear that change, you may miss identifying an odor in the search area and that can cause you to lose out on a chance at a title. I had been at a disadvantage for years in that I could not hear my dogs’ breathing changes. Dr. Finnegan fit me with new Lyric hearing aids and magically I could hear better than I had in years. These devices opened up a new world for my dogs and me! From left to right: Baxter, Zoey, and Red competing in K9 Nose Work with Debbie.